Boneless skinless chicken breast and spinach wrapped in a flatbread served with a side of Caesar dressing. 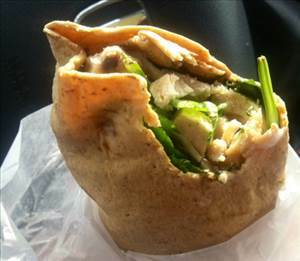 Wrap chicken and spinach in flatbread. Mix cayenne and dressing together and serve as a dip. 50 members have added this recipe to their cookbook. There are 305 calories in 1 serving of Spinach Chicken Caesar Wrap. Calorie break-down: 29% fat, 23% carbs, 48% protein.